Heat the clarified butter in a non-stick frying pan, add the potatoes and rosemary. Fry the potatoes over a medium heat, turning occasionally, for approx. 30 mins. until crispy, season with salt. Bring the cranberries to the boil with 1 1/2 tbsp of red port, allow to cool in a small bowl and steep for approx. 15 mins. Bring the remaining port and stock to the boil in the same pan, along with the shallots and rosemary. Reduce the liquid to approx. 100 ml, strain and return to the pan. Add the butter gradually, mixing with a whisk. Return the pan to the hob a few times to barely warm the sauce; it must not boil. Stir until the sauce is creamy. Add the softened cranberries, heat gently and season the port wine jus with salt. Heat the clarified butter in a frying pan. Reduce the heat. Fry the meat in batches over a medium heat for approx. 1 1/2 mins. on each side, season. 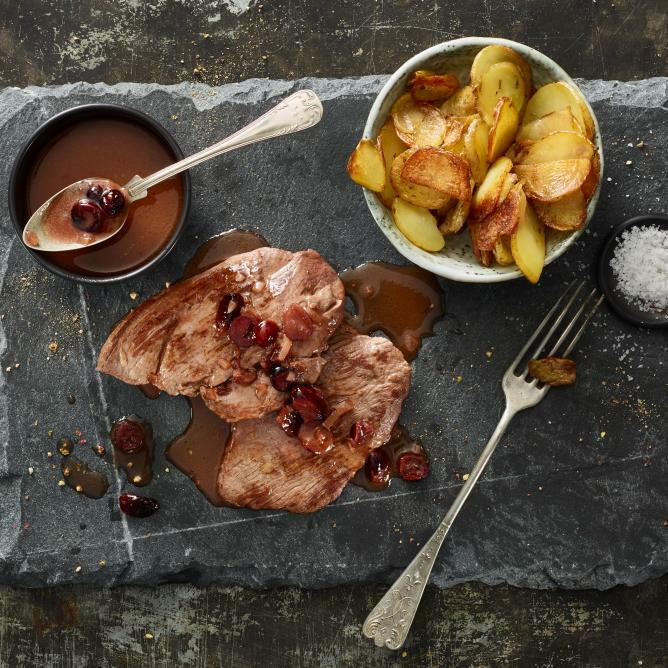 Serve the meat on warmed plates, drizzle with the port wine jus. Serve with rosemary potatoes.